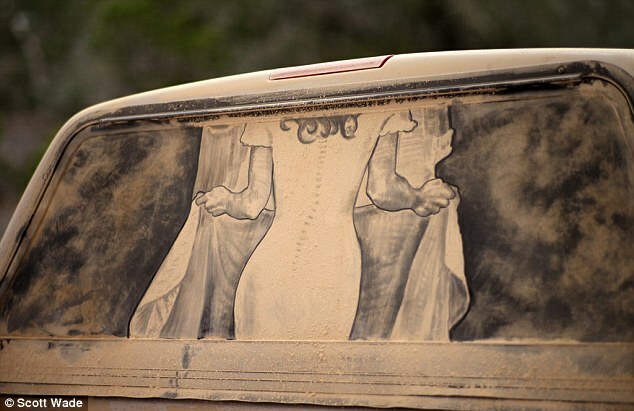 » Dirty workbut someone has to do it. 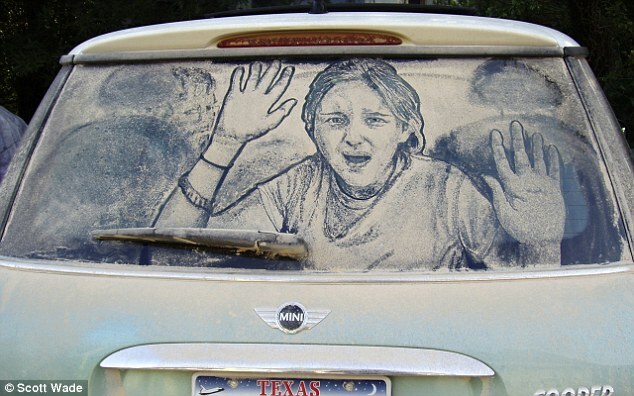 To most people a dirty windscreen means it’s time to take your car for a wash but for one man in Texas it’s an excuse to create a piece of art. 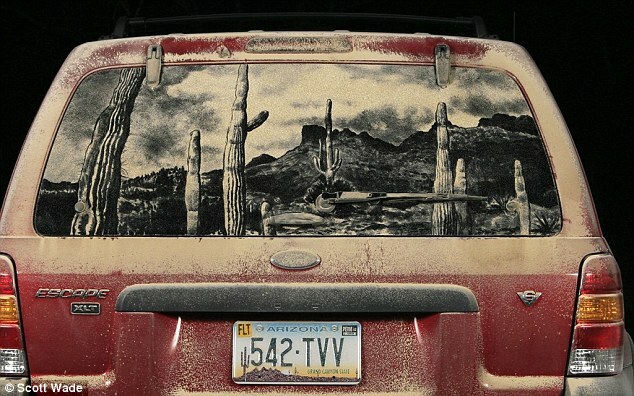 Scott Wade works as a graphic user interface designer, but his time is increasingly spent creating his own inimitable works of art on the back windows of vehicles. 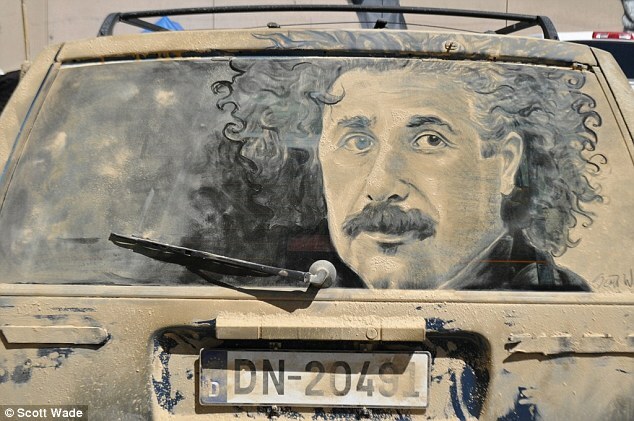 Wade has made a name for himself as the world’s premier dirty car artist and in recent years his unusual talent has taken him around the world. The inspiration behind his craft dates back more than 20 years to when he lived at the end of a long dirt road in Central Texas. 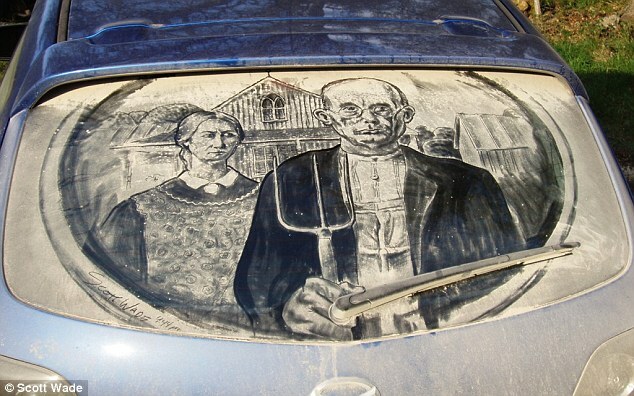 According to Wade, frequent trips up and down the lane caused the family cars to become quite dirty which prompted him to casually doodle and draw faces on the windows. ‘My father was a great amateur cartoonist and I must have picked that up from him, because my natural tendency was always to draw funny faces,’ he writes on his website. As time progressed he started to experiment with his drawing technique and found that he could use the pads of his fingers to brush very lightly to get grey tones. Next he progressed to using paintbrushes and nowadays he use a rubber ‘paint-shaper’ tool and assorted brushes. 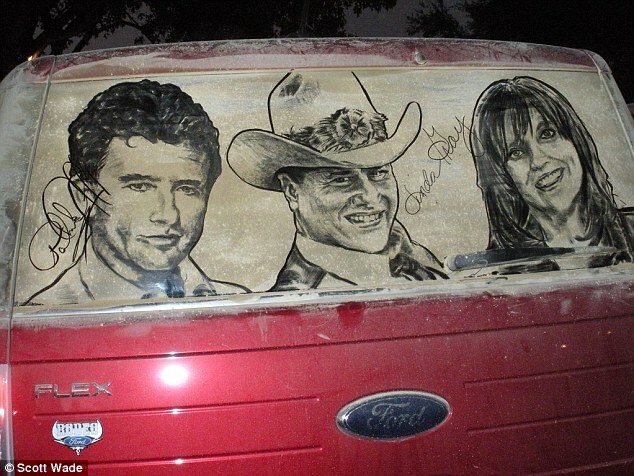 Wade enjoys reproducing famous paintings by the old masters on backs of hatchbacks, trucks, and SUVs, but he is also willing to try and reproduce almost anything. 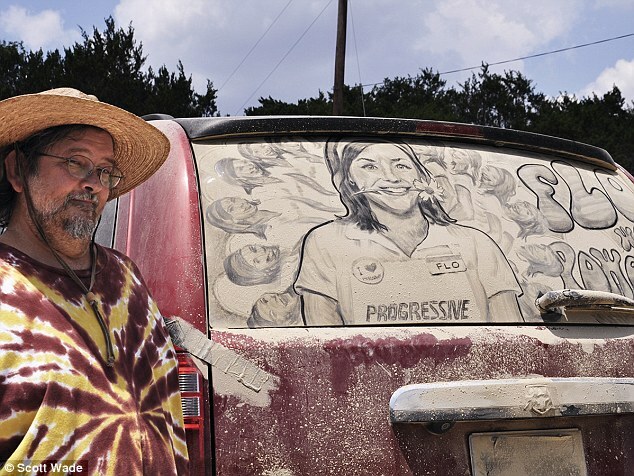 One of his most recent favorites was to draw Progressive Insurance’s Flo with a ‘FLOwer Power’ motif on the back of a Dodge Grand Caravan. ‘To me it’s not so much the subject, but the beauty of the medium that attracts me,’ he explained. Depending on the complexity of the image, the art works can take just a few minutes or as long as six hours to complete. 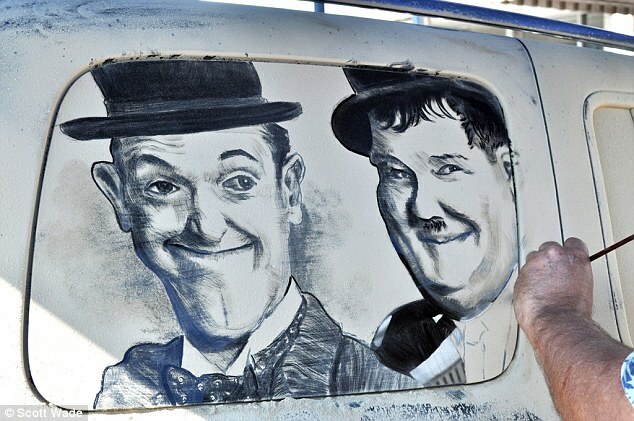 On average he says he spends between an hour and a half and three hours on each drawing. 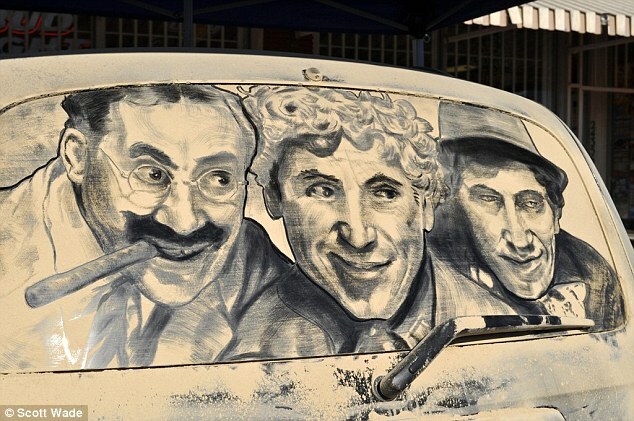 His drawings certainly attract plenty of attention and he says that he and his family regularly get stopped by people who want to have their picture taken with his art work. ‘One time a guy in a pickup truck blocked me in as I was leaving the grocery store parking lot. ‘He apologized, but asked me to stay there while his daughter went back in the store to buy a disposable camera,’ he recalls. Initially his art work attracted local attention, but as news of his talent has spread so too have the offers to travel and draw elsewhere. Wade has now done art shows, festivals, auto shows in places as far flung as London, Istanbul, Lisbon, Mexico City, Vancouver and Toronto, as well as all over the U.S. He is also regularly hired by ad agencies, PR firms and event management companies to demonstrate at events, do ‘stunts’ and create work for ad campaigns. 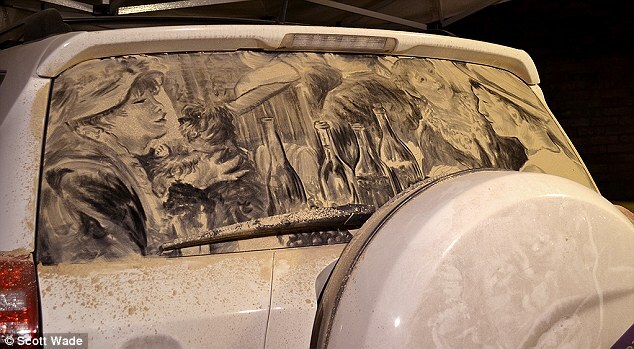 Wade claims that days and days of accumulated dirt make for the best canvases, but he’s also perfected a routine that prepares a car for art in about 10 minutes. ‘I couldn’t do the many events I do each year without having developed the “artificial canvas,” as I call it,’ explained Wade.